The next Pattaya City Expats Club (PCEC) meeting will be held on Sunday, May 4. Everyone is warmly welcome. Five club members who took a luxury cruise aboard the Cunard Line’s Queen Elizabeth from Hong Kong to Vietnam and Singapore will share their experiences and photos. The Club meets every Sunday morning at the Tavern by the Sea restaurant located on the north end of Beach Road (part of the Amari Orchid Resort). The program starts as usual at 10:30 a.m. with a buffet breakfast available from 9 to 11 a.m.
Green Pattaya is organizing a clean-up day on Pratamnak Hill outside the Royal Cliff Condo and Sheraton hotel on Saturday, May 3 from 9.30 a.m. – 1 p.m. Volunteers are more than welcome to come along and help out and will be provided with drinks and snacks. To coincide with the event, Restart Life will also be collecting any unwanted items of clothing to be donated to homeless, poor and destitute people in Pattaya. For more information, visit www. facebook.com/GreenPattaya. The Thailand ‘Star Wars’ fan club will be staging a special fund-raising event at Central World in Bangkok to mark the official Star Wars Day on Sunday, May 4. Members of the club will dress up in authentic costumes as Darth Vader, Storm Troopers and Scout Troopers and for a 350 baht donation members of the public will receive a Star Wars fan club T-shirt or for a 150 baht donation, a Star Wars badge. Donors can also have their photo taken with their favourite Star Wars characters. Proceeds from the event will be donated to the Phyathai Babies’ Home charity. Oyster & Bubble promotion at Horizon restaurant. Enjoy a “Cowboy night” BBQ buffet at Flames restaurant every Monday night from 19.00 – 22.30hrs – priced at only THB 1,299 net per person. The buffet offers a wide variety of dishes including steak, polar fresh seafood, salad, a dessert buffet and ice-cream. You can also enjoy live country music performances from 19.00 – 21.00 hrs. Flames is located on the beach front of the Centara Grand Mirage Beach Resort in north Pattaya. For reservations, call 038 301 234 ext. 4272. Tapas & Wine at Dusit Thani Pattaya. Tapas & Wine Fusion at Dusit Thani Pattaya: For only THB 199++ enjoy a relaxing night with a glass of red or white wine together with a plate of appetizing tapas featuring assorted cold cuts (coppa, Parma ham, Paris ham, mortadella, salami); marinated olives and pickles; Norwegian salmon rillettes; Tomato, mozzarella and fresh basil; Grilled marinated vegetables; International cheese board; Artisan bread with herb butter; Seafood salad; Tomato with red onion salad and artichoke salad. Second plate of tapas goes for only THB 69++. Live band music from 7:00 p.m. until midnight at the Lobby Lounge, 4th floor of Dusit Thani Pattaya. Tapas & wine served from 6:00 p.m. – 10:00 p.m. For more information or reservations, call 038 425 611-7 Ext. 2149, 2476. Louis Restaurant is offering a new weekly set menu alongside the regular a la carte menu items. The set menu includes a choice of starters and main courses of pan fried John Dory fish fillet (THB 490), Piccata of chicken breast in a light red wine sauce (THB 490), or Australian beef cubes in light mustard/herb sauce (THB 850), followed by pineapple strudel and vanilla ice cream for dessert. Louis Restaurant is located on Naklua Soi 31 or North Pattaya Road Soi 6. For reservations contact Vichai on mobile 081 001 3298 or email: alois.pattaya @gmail.com. Centara Grand Pratamnak Resort Pattaya: At Oceana Restaurant from 6:30 to 10 p.m. daily enjoy a 4-course Royal Thai Cuisine set dinner for THB 777 net, including a glass of red or white wine. Ruffino Restaurant and Lounge offers Monday to Wednesday from 7-9 p.m. a homemade pizza “buy 1 get 1 free” promotion plus order a glass of wine or refreshing cocktail at special sunset prices from 5-7 p.m. Chef Luca has also created a delicious rustic 3-course set dinner perfectly paired with a carafe of red or white wine for THB 888 net per person, only available on Thursday’s from 6 to 10 p.m. Relax later to the tunes of resident DJ Diva who spins the latest trendy sounds from 7-11 p.m. Afternoon Tea is also available daily from 3-5 p.m. at the Espresso Bar for THB 700++ per set for 2 persons, including scones and clotted cream, freshly made sandwiches and cakes, tea and coffee. Centara Grand Phratamnak Pattaya is located on Pratamnak Soi 5. For more information and bookings call 038 306 337 or e-mail: [email protected] chr.co.th. 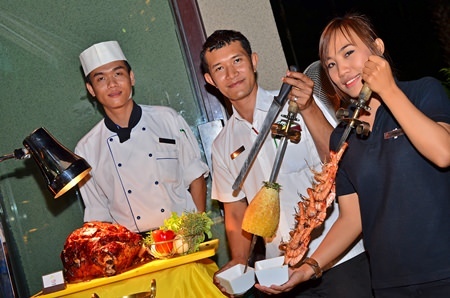 Halal international buffet dinner @ Harbour – only THB 420 net per person. The buffet dinner includes halal food, an international buffet line and many selections of dessert. The food is certified and cooked by a halal chef with 40 years experience. Both indoor and outdoor dining options are available. Harbour restaurant is located at the A-One Royal Cruise Hotel on Pattaya Beach Road (Soi 3), Open daily 6.00 pm – 10.00 pm. For more information, call 038 259 555 Ext 4236. Sugar Hut Restaurant is open for lunch with set menu prices from 240 to 350 baht net/set. Menu items include chili fried rice, pork soup with tofu, noodles, fresh spring rolls, salad, fruit, desserts and more. For inquiries and reservations, call 038 364 186, 038 251 686. Great Brazilian food at Zico’s. Friday Crab Feast at Dusit Thani Pattaya. 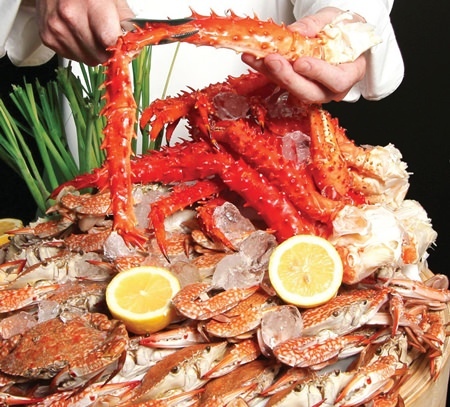 Friday Crab Feast (& other global cuisine) at The Bay Restaurant, Dusit Thani Pattaya. Come as 3 and pay only for 2 and then, win some great dining vouchers during the lucky draw. Chef Alistair Carter’s dining event features a wide variety of global cuisine with the spotlight on crabs. There’s meat and other seafood items on the grill, superb Thai and western appetizers as well as desserts and much more. Only THB 850++ per person (food and one complimentary glass of wine) or THB 1,449++ per person for buffet and free flowing wine, beer, juice or soft drinks. The Bay is located at the Dusit Thani Pattaya Resort, next to the Dolphin Roundabout in North Pattaya. Opening hours are Monday to Sunday – 11:00 a.m. to 10:00 p.m. For more information and reservations, please call 038 425 611-7 ext. 2149-2476. The open kitchen concept at Edge restaurant, Hilton Hotel Pattaya, creates an interactive dining experience combined with natural light and breathtaking views. Monday’s “Post weekend BBQ” features freshly grilled sausages, Korean style pork cuts and chorizo burritos while Tuesday’s “Mediterranean Fare” includes Middle Eastern dips and salads, pizza and pasta. On Wednesday, Edge presents “Burgers, Salads and Gourmet Sandwiches” where guests can create their perfect burger, toss a fresh salad or grab a gourmet sandwich. The tastes of Southeast Asia, India, China and Japan come together for Thursday’s “Extended Asia” followed by Friday’s “Seafood Pattaya” where the crystal waters offer up fresh local prawns, crabs and lobsters served on ice or grilled. Saturday’s “Classics & Confectionaries” presents timeless favorites such as Greek salad, oven-baked whole salmon, green curry and bouillabaisse and margherita pizza. In addition, guests will be able to indulge in traditional Thai desserts with a modern twist. Every Sunday, the chefs pull out all the stops and offer the hotel’s famous “Sunday Brunch” that brings together a wide selection from around the globe. Bookings are absolutely essential for this very popular event. Monday to Thursday @ THB 480 net; Friday and Saturday @ THB 540 net, Sunday Brunch @ THB 1400 net; Wine Buffet @ THB 1100 net. “Seven Days, Seven Themes” is available from Mondays to Saturdays from 12 p.m. to 2.30 p.m. and from 12 p.m. to 3.30 p.m. on Sundays. An International Buffet Dinner is also available 7 days a week priced at THB 920 net on Monday – Thursday and Saturday & Sunday, and THB 1100 net on Friday. Edge restaurant is located on the 14th floor of the Hilton Hotel Pattaya. For bookings, please dial +66 (0)38 253 000. 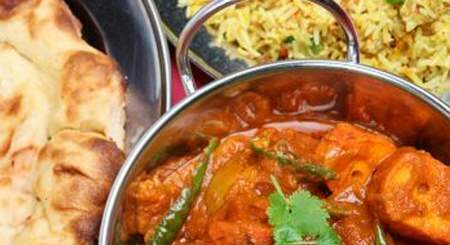 Monday Curry Night at Tavern by the Sea. Eat to the New Beat at Starz Diner located at the Hard Rock Hotel Pattaya between 2nd Road and Beach Road, Central Pattaya: A selection of Pan Asian and continental flavors, from the griddle, BBQ char-grill, pan, fryer, steamer, wok, and tandoori oven, as well as some really delicious desserts. Sat: THB 850++, Sun-Fri: THB 750++ food only. Sat: THB 1,080++, Sun-Fri: THB 980++ including free flow drinks. Children under 11 years of age eat for free. Show time for live music is from 6:30 p.m. – 10:00 p.m. For more information call 038 428 755-9 or go to http://pattaya.hardrockhotels.net. Scottish Salmon at Oasis restaurant. 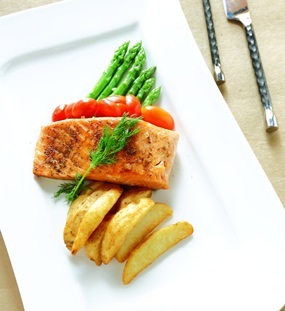 Oasis Restaurant is serving “Scottish Salmon” throughout the month of May. This gourmet fish is available peppered Carpaccio style with rocket salad and balsamic dressing, Cajun spiced with lemon butter and potato wedges or the more traditional approach of being poached with Hollandaise sauce, asparagus and boiled potatoes. Prices start at THB 280++ (subject to service charge and VAT). Oasis restaurant is located at the Centara Grand Mirage Beach Resort Pattaya. Open daily from 06.00-23.00 hrs. For more information or reservations, call 038 301 234 ext 4397. The Peak restaurant offers a variety of dim sum items during the ‘All You Can Eat Dim Sum for Lunch’ promotion. 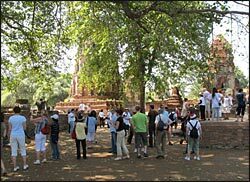 Price is just THB 705 net per person. Lovers of Peking Duck, prized for the thin crisp skin, can also enjoy lunch with a whole Peking Duck on the centerpiece at only THB 1,765 net. What’s more, roasted suckling pig is offered at a discounted price of THB 1,882 (whole roast). The Peak Chinese Restaurant is located on the 8th floor of Dusit Thani Pattaya next to the Dolphin Roundabout in North Pattaya. Open daily from 11:30 a.m. to 2:30 p.m. and 6:30 p.m. to 10:00 p.m. For reservations and more information please call 038 425 611 to 7, ext. 2276. 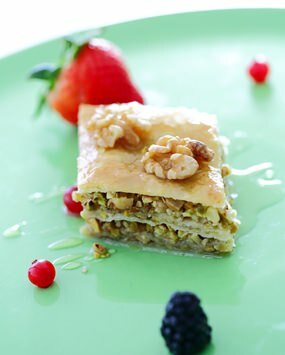 Greek classic Baklava available at Centara Grand Mirage Beach Resort Pattaya. “Arabian Delights” are available throughout the month of May at the Vistas Lobby Lounge of the Centara Grand Mirage Beach Resort Pattaya. Treats include Basposa – a sweet sugar soaked cake made from semolina, Kanafa – a Leventine sweet cheese pastry, and the famous Baklava from Greece made with filo pastry, chopped nuts and honey. Prices start at just THB 115++ or take advantage of the special buy 1 cake get 1 free during happy hours from 7 p.m. – 10:00 p.m. The Vistas Lobby Lounge is open daily from 9 a.m. to 10:00 p.m. For more information or reservations, please contact (038) 301 234 ext. 4280. Antipasto Pizza at Havana Bar & Terrazzo. Havana Bar & Terrazzo at Holiday Inn Pattaya has introduced a delicious pizza of the month for May. 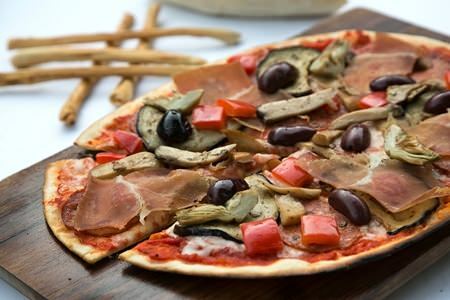 “The Antipasto Pizza” is a signature pizza topped with Parma ham, pepperoni, artichokes, eggplant purple, eryngi mushroom, red capsicum, and black kalamata olives served on a thin and crispy base. From now until May 31, Holiday Inn invites you to discover “The Antipasto Pizza” at only THB 395 net and receive 50% discount from 3.00 p.m. to 5.00 p.m. daily. For more information or reservations, call 038 725 555. The Thai Garden Resort offers nightly dining presentations with different themed buffets! Happy Hours are from 17:00 – 18:00 with most drinks at 50% discount. The “All You Can Eat Buffet” starts at 18:00 until 21:00 hours and offers a wide variety of soups, salads, bread, cold cuts, smoked salmon, choices of hot food dishes, live cooking stations and of course a home-made desserts selection. All this for just 399 baht net for adults and 199 baht net for children under 12 years old. What you see is what you pay, no additional service charges or VAT. For reservations call 038 370 614 or make your booking at www.thaigarden.com under “buffet reservation”. Thai Garden Resort is located on North Pattaya Road, 200 meters from the Dolphin roundabout and 200 meters before Tesco Lotus. From now until 31st May 2014, the Bangkok Hospital Pattaya is offering a special 2 for 1 medical check-up promotion. The ‘Healthy Family’ packages are valid for 1 month from the time of purchase. For more information, call 038 259 999 (8a.m. – 4 p.m.) or visit website: www. bangkokpattayahospital.com. eforea spa at Hilton Pattaya has announced its new special promotion package, “Relax, Renew and Emerge Brighter”. Guests can book the package for only THB 3,500 and receive a 90-minute meditation massage, inspired by traditional Australian Aboriginal techniques, which focuses on instilling a deep sense of mental and physical relaxation. A choice of native aromatic oils is prescribed to suit your individual needs to rejuvenate, harmonize or detoxify. For an additional THB 500 guests can enjoy a 30-minute body scrub and receive an eforea music CD, which features soothing tunes that they can relax to in their own home. For more information, call 038 253 000, email [email protected] or visit eforeaspa.com. Amari Orchid Resort Pattaya guests who make bookings via www.amari.com can now take advantage of a special spa treatment offer. Make a reservation for a spa treatment from 10:00 to 13:00 any day from now until 31st October 2014 at Breeze Spa and the second person’s treatment will be free of charge. For more information, contact Breeze SPA, Amari Pattaya on 038 418 418 ext. 840. Local amateur dramatics group the Pattaya Players have announced auditions for their next production of 3 one-act plays to be staged on 27 & 28 June. The open auditions will take place at the Eastern Grand Palace on Soi Khao-Talo at 6.30 p.m. on Tuesday, May 6. Actors, both male and female are required. For more information, email [email protected] or visit website: www.pattayaplayers.org. “Ladies Night” @ Havana Bar – Every Wednesday ladies can enjoy the happy hour ‘Buy 1 Get 1 Free’ on selected drinks from 5.00 p.m. – midnight. A minimum of 3 people are required for the promotion to be applicable. The Havana Bar is located at the Holiday Inn Pattaya hotel on Beach Road, North Pattaya. Opening hours: Mon-Thu 2.00 p.m. – 1.00 a.m., Fri-Sun 12.00 p.m. – 1.00 a.m. For more information or reservations, call 038 725 555. Hard Rock Cafe Pattaya presents ‘Mix Tape’ every Friday night from 9 p.m. till 2 a.m. at the Moon Deck. A roster of four guest DJs play soulful funky sounds, deep house, tech and all manners of groovy tunes laced with rock & roll. For more information and/or reservations, call 038 426635, send e-mail to [email protected] or go to www.facebook.com/HardRockCafePattaya. Ruffino Restaurant & Lounge at Centara Grand Phratamnak Resort Pattaya presents Thailand’s premier female music maestro, DJ Diva, every Thursday, Friday & Saturday from 19:00 – 23:00. Centara Grand Phratamnak Resort is located on Soi 5, Pratamnak, South Pattaya. Tel. 038 306 337 for more information. Come and enjoy live music at the Jazz Pit Pub from 7 p.m. to 11 p.m. every day (except Tuesdays & Wednesdays). Listen to great music by Thomas Reimer, one of the most famous European Jazz guitar players. If you play an instrument, you are welcome to come along and join in the jam sessions every Monday evening. Jazz trio every Friday at 7-11 p.m., with Thomas Reimer (guitar), Andy Goodson (bass), and Peter Couling (drums). The Jazz Pit is located on Soi 5 off Pattaya Beach and 2nd Road. Tel: 038 428 374. Al-Anon Family Group: Are you bothered by someone else’s drinking? Maybe we can help. Sunday meeting at 2 p.m., Pattaya, Satree Pattaya Center, 519/56 Pattaya 2nd Road, Soi Skaw Beach near the Skaw Beach Hotel, next door to Scandalia Restaurant. Thursday meeting is at 10:30 a.m. on the 4th floor of Jomtien Plaza Condotel. 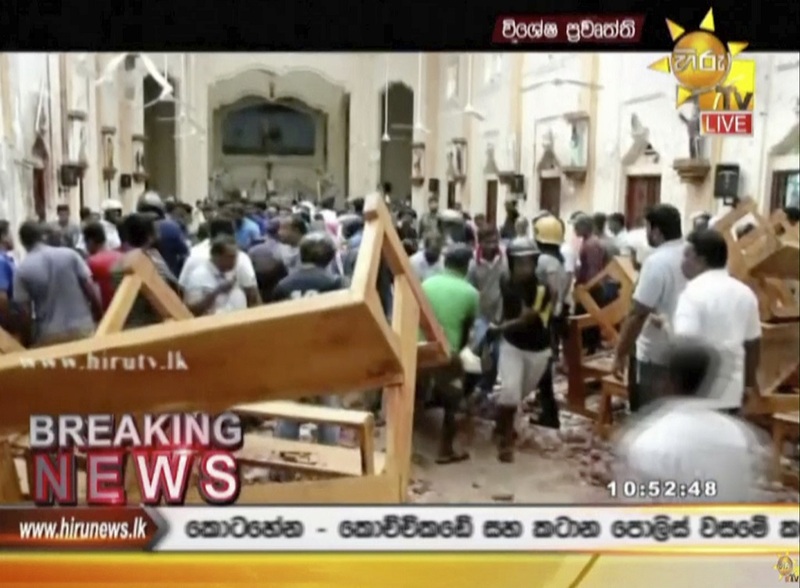 For more information, call the Helpline 092 674 4109 or Richard 084 867 4138. Alcoholics Anonymous meetings in Pattaya: The Pattaya Group meets Wednesday and Thursday at noon (open); Monday, Tuesday and Friday at 5 p.m. (closed) and Wednesday, Thursday, Saturday and Sunday at 7:30 p.m. (closed) at the Satree Pattana Center, Soi Skaw Beach (2nd Rd): contact Mick on 087 994 6224, Bob 087 939 2463 or Joe 082 715 2082. The Good Morning Pattaya Group meets 9 a.m. every morning. All meetings are ‘open’: contact 084 564 8479. The Jomtien Group meets every day at noon at Jomtien Long Stay Hotel: contact: Warren on 086 158 9688, Andy 080 570 1404 or Henk 086 070 6684, Thai contact: Somchai 081 445 3302. The Scandinavian Group meets on Tuesdays and Fridays 6 p.m. at the Norwegian Seaman’s Church, Thappraya Road Soi 7: contact Hans 085 135 7755 or Rune (Rayong) 089 754 9515. 10.30 a.m. meetings every day at Satree Pattana Centre on Soi Skaw Beach off Second Road. Call 084 564 8479. 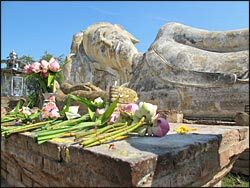 For the past 28 years the Samaritans of Thailand have been providing confidential crisis intervention services over the telephone. The English-speaking unit, Samaritans English Help Line operates 24 hours a day, 7 days a week to provide support to the expatriate community. English-speaking staff, trained in crisis intervention will provide active, non-judgmental and empathetic listening services on the phone. All calls will be handled on an anonymous basis and are free of charge. Please call (02) 713-6791 (24hrs a day, 7 days a week). Overeaters Anonymous meetings in Pattaya/Jomtien – The ‘Up to You’ group meets Wednesdays at 9:30-10:30 a.m. in the housing area just behind Pan Pan Restaurant in Jomtien on Thappraya Road. Call Steve at 038-364-207(h) or 089-250-1359 (cell) for directions or more information. Narcotics Anonymous – Hotline: 082 811 2686. There are 3 English speaking meetings in Pattaya near Central Festival and 2 more in Jomtien each week. Also regular Thai speaking meetings at 12 Midday every Sunday and Persian Farsi speaking meetings at 5.30 pm on Thursdays. Please call the Hotline for details.